Two levels of supervised clinical work (practicum and internship) in the counseling program are required of students matriculating toward a degree in Clinical Mental Health, Marriage and Family, Rehabilitation (Chemical Dependency and Severe Disabilities) or School Counseling. Students in the Business and Organizational Management programs are only required to complete a supervised practicum. As a trainee, students are involved in all aspects of a counselor's role as a specific site. Field sites enable students to integrate professional aspects of a counselor's role. 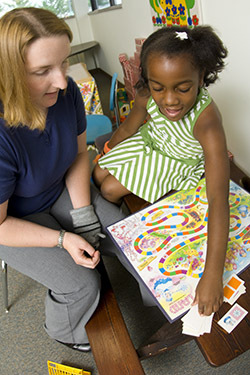 Field settings include a variety of off-campus settings that reflect the scope and practice of professional counselors. Students are encouraged to explore internship experiences tailored to their individual needs and interests, in line with their own particular professional goals and talents. For School Counseling (Pupil Personnel Services Program) counselor-trainees, K-12 public schools range from urban to suburban to rural. For rehabilitation majors, the site supervisor must be a CRC or a CCDCIII for chemical dependency students. For students intending to become a Professional Clinical Counselor, the site supervisor must be licensed as an LPCC or PCC with the supervision endorsement. Supervision modalities are varied, but always include reviews of audiotapes or videotapes of a variety of counseling sessions. If you are looking for some help in picking out possible Practicum or Internship sites, there is a list of recent sites and supervisors (with contact information) available from the Graduate Assistant in 108 Allyn Hall. An average of 7 clock hours per week for Fall and Spring semesters and 9 clock hours per week for summer semester are required for a minimum of 100 total clock hours on site. A minimum of 1 clock hour per week of direct face-to-face supervision with the PCC-S Site Supervisor is required. The Clinical Mental Health Counseling, Marriage and Family Counseling, Rehabilitation Counseling, and School Counseling Internships are 600 clock hours of on-site experience. The Clinical Mental Health Counseling, Marriage and Family Counseling, Rehabilitation Counseling, and School Counseling Internships require a total of 6 graduate credits of CNL 8670. The student is required to complete a minimum of 600 clock hours on-site. Of these 600 hours, 240 clock hours shall be direct client contact hours. At least 10% of the direct contact time must be individual counseling. At least 10% of the direct contact time must be group counseling. See manuals for specific major requirements. Rehabilitation Counseling students are required to complete a total of 6 graduate credits of RHB 8670 for a minimum of 600 hours at the internship site. Following are deadlines for practicum and internship application (Appendix I), proof of professional liability insurance, program of study, and unofficial academic transcript. Contract (Appendix II), supervisor information sheet (Appendix III), copy of supervisor's license, site information sheet (Appendix IV), and copies of counselor trainee application form (for those working toward a PC or PCC license or working at a community mental health center) are due two weeks later. Questions should be addressed before the due dates. Deadlines are firm. No exceptions! Please note artifacts will no longer be required with practicum and internship applications beginning in fall 2018. The department has transitioned over to a completely new format that will be explained in revised student handbook and practicum and internship manuals. *Note: For information regarding when appendices are due, please refer to the Practicum and Internship manuals. Information on various companies offering liability insurance is available in 108 Allyn Hall. You do not need to be a member of a professional organization in order to get insurance. However, students are encouraged to join their respective professional organization. If you have any questions please contact your Program Advisor or contact the department of Human Services.